Should You Do Weight Training And Weight Lifting In Middle Age? Lifting at any age has rewards, but after 50 it can change your life. Read here to find out whether heavy lifting is safe for adults 50 and over. Last month I was walking around in my neighborhood, I met my friend living in next block to mine. He asked me:“Ever since I have crossed 50, I have gained some extra weight and my body is no longer as firm as it use to be. I faces such questions off and on. So I decided to research and write a post on “Should You Be Lifting Heavy Weights After 50?”. After extensive research of one whole month and talking to many experts here is the answer in this article form. Why Weight Training After 50 Is Important? As you age and cross 50 you start suffering from issues like weight gain, lose of stamina, joint stiffness, sore backs, sleep troubles. The main culprit of these conditions and a number of other medical conditions in old age is muscle loss and its shrinkage. Losing muscle is destructive and damaging to your health and fitness, as it’s the part of your body that is active and burns of the calories that you consume. Even when you are resting your muscles are burning calories. Thus, when your muscle fibers get shrink or lost then your metabolism turns sluggish and as a consequence thereof the extra calories that are not being burned are stored as fat. What You Should You Do To Avoid Muscle Loss In Old Age? But the good news is that weight lifting and resistance exercise can back pedal much of this muscle reduction and enlarge the size of shrunken muscle fibers. Weight lifting not only can build muscle, but it can also make you stronger, and revs-up your metabolism. Weight lifting is one of the most important forms of exercise that you can do to avoid such health issues, stay firm and remain fit in old age. Yes, weight lifting or strength training in later life has many advantages. As women and men grow old, their muscle fibers dwindle in number as well as in size, leading to loss of strength, balance, and coordination. Actually, people can undergo some of these diminutions as early as in 40s. Whereas most seniors know that they require regular aerobic exercises such as walking, swimming, or running to strengthen their heart, boost lungs power and tone-up their bodies, many do not know the importance of weight or resistance training. Many studies have confirmed that weight lifting, in fact, is the only type of exercise that can significantly slow, and even reverse, the regressions in muscle mass, bone density, and strength that were once considered as inevitable parts of aging. (i) Weight or resistance training exercises should be performed 2 to 3 times a week to work major muscle groups including arms, legs and the core. (ii) Lift a weight that’s heavy enough to achieve 10 to 15 repetitions per session before muscles become fatigued. (iii) ACSM recommends both strength training and aerobic activity on a regular basis. Just Fitness Tip: Aim for 20 to 60 minutes of aerobic activity 3 to 5 days a week and weight training should be done for 20 to 30 minutes 2 to 3 times a week. And, if you feel comfortable you may increase the time and frequency gradually as you gain strength. 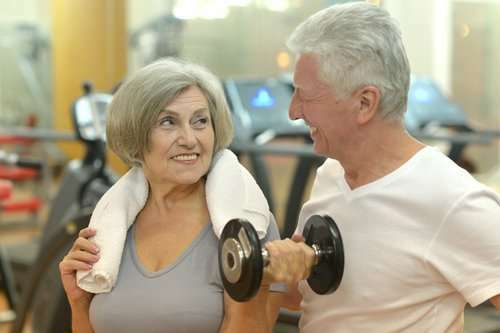 Please share your experience and tips on weight lifting in old age with our readers.